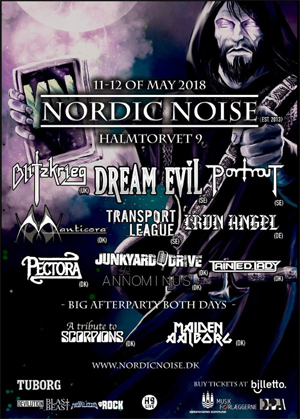 2018 is the 6th year for the 2-day rock-metal festival NORDIC NOISE, taking place on the 11th and 12th of May in Copenhagen, Denmark. NORDIC NOISE mainman Michael H. Andersen says "No doubt the heaviest program ever for Nordic Noise. I'm glad to see the direction we took last year is what the people want. Oldschool, Loud and Heavy with a great mix of established artists and fresh blood. A new thing this year is we're having a big afterparty both nights with the best Danish cover bands playing SCOPRIONS and IRON MAIDEN songs". This year NORDIC NOISE have moved the festival to the finest new music venue in Copenhagen called Halmtorvet 9. A classy place with a superb concert hall and a lovely courtyard garden, to enjoy plenty of beer and good food.